powerOne® combines 14 popular conversion calculators plus a full-featured calculator. Calculate fast, keep a history and share with others. Conversions, both US and metric, have never been faster. Fourteen templates with hundreds of calculations covers areas, lengths, mass, volumes, currencies (with auto updated data), dates, energies, forces, fuel efficiencies, interest, powers, pressures, temperatures and velocities. 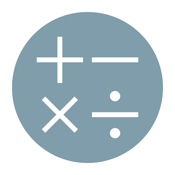 And for those one-off calculations use powerOne's elegant algebraic and RPN calculator. Perform calculations in either decimal, scientific, engineering, fraction or feet-inch format with functions that include powers, logs, trig and more. Past computations are always available at your fingertips. powerOne automatically saves a history of your calculations. Name them, annotate them, share them or re-calculate. Whether colleague or client, powerOne makes it easy to share the results. Just choose who to send it to and the results are in the mail. After 13 years and more than 15 million software calculators distributed, Infinity Softworks has earned its reputation for high quality apps. We'd love to hear from you, whether ideas, help or problems, at help@infinitysw.com.